Fitness Fashion: Mill City Running and Lululemon! A few weekends ago, I attended an event at Mill City Running to mark the beginning of their partnership with lululemon . 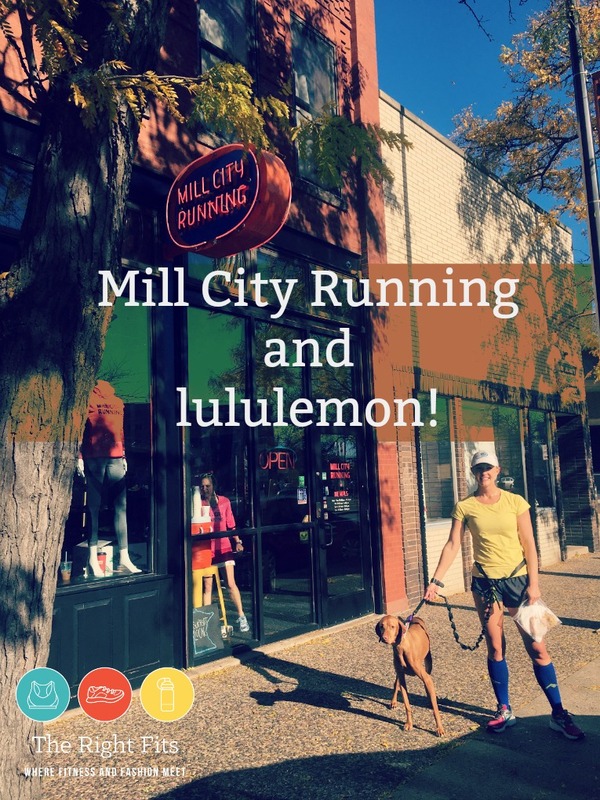 I believe Mill City is the only local running store that carries lululemon – pretty cool! 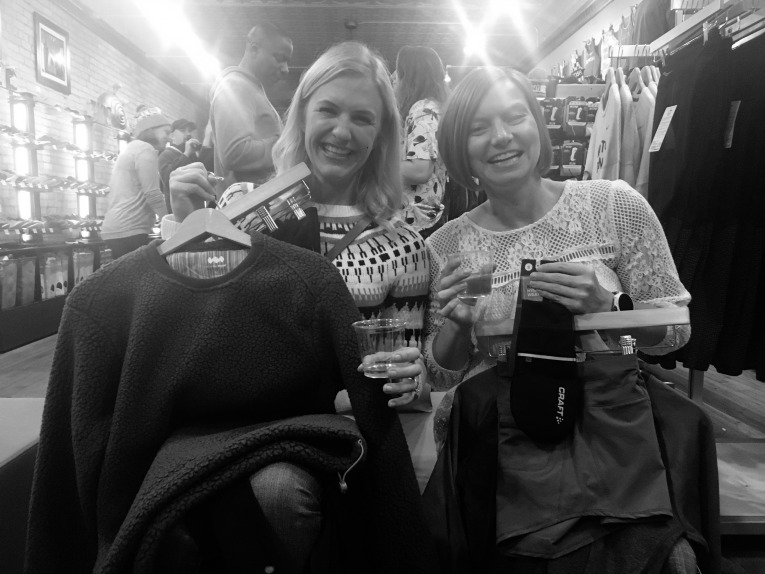 The launch party included drinks, appetizers, and a free ($78 value) yoga mat for the first 50 people to purchase something lululemon ! I could bring a ‘+1’, so I invited my friend Christie to attend with me. Wine and shopping? Sign us up! The party went from 6-8 pm. Due to that Friday’s unwelcome snowstorm, traffic was a little slow getting downtown, so we didn’t arrive until 6:30. Some of the lululemon gear had already been picked over in terms of sizes by that time, but I was still able to snag a pair of these tights ($108). They are meant to ‘hug’ you or fit snugly, so even though the size 6 was snug, I went with it anyways. I actually tried them out on my 15 mile run the next day and LOVED the snug fit. They aren’t designed for super cold weather, but were good for mid-30’s and had a plethora of pockets for my GUs and what not. I think you could even put an iphone in the side pocket while running. My second purchase was a pair of the Oiselle lux track pants. Oiselle was not part of the launch, but I couldn’t resist the pair of cozy pants for either lounging around the house or wearing as warm-ups pre-race. 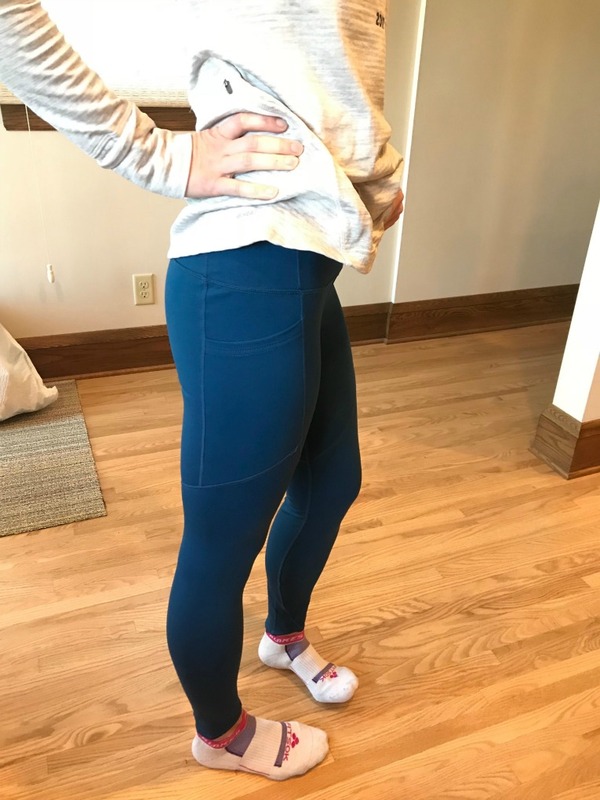 Christie and I both purchased some of the Oiselle Flyout Tights in Curfew blue I love the color, the tight “hugging” fit, and the large deep side pockets (as well as a zippered back pocket.) They aren’t meant for the super cold runs, but they served me well on a 30 degree long run. 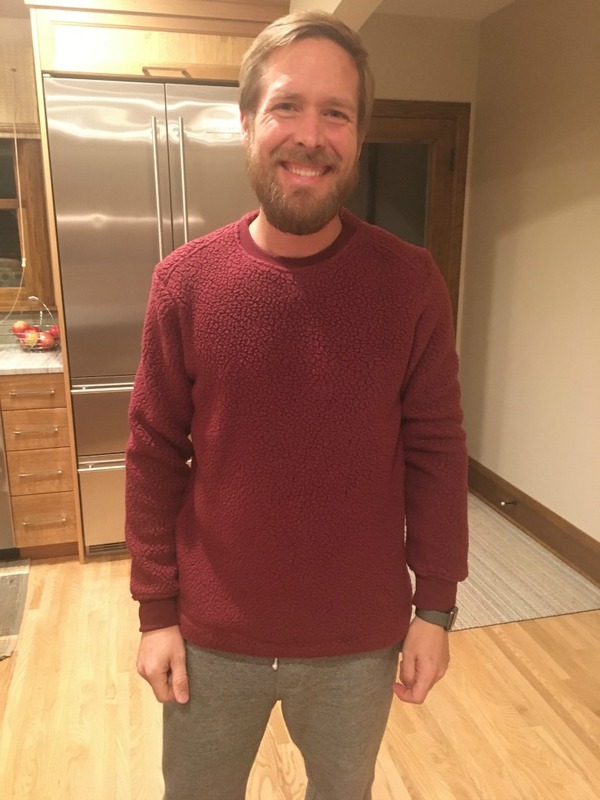 My final purchase of the evening was a gift for Dustin, this Janji Himal Expedition Fleece Crew sweatshirt. It was kind of funny because my friend Sara, who works at MCR, said she was getting teased that no one would buy the sweatshirt, but I saw it on a mannequin and loved it and wanted to buy it for Dustin right away! At first he wasn’t sure about it, but after trying it on, he said it was cozy and he ended up happily wearing it the next day. Christie also purchased the Rabbit “Sleevie Wonder” <– (so cute!) some Oiselle rogas, and some Craft running gloves. Mill City carries all the great brands and it’s fun to see them add another with lululemon ! Considering that the Twin Cities has at least four standalone lululemon stores (West End, Mall of America, Galleria, St. Paul) it’s pretty impressive that there is still a demand for more lululemon here! But I can see how perhaps the running community is a bit of an untapped resource that might not be familiar with lululemon as a strong choice for running apparel. Some may see it as a yoga brand or a place to buy athleisure. But as a runner, I think there are some things that lululemon does really well, that runners may not be exposed to until they find the items in their local running store! For example, I love their speed shorts, their bitty bracer (no longer made, but was/is one of my favorite sports bras), their Swiftly Tech base layer long sleeve, (I have a few that I wear over and over) and several of their running tights as well. Carrying lululemon in a boutique running store like Mill City Running makes sense, as they can choose to carry these standout running items amongst all the rest of the great running brands. It’s not as overwhelming to a visitor either as perhaps a visit to a full lululemon store might be. You know that if you’re at Mill City Running, your local running store, that you’re working with experienced runners who will point in you in the right direction for the RIGHT FIT in running attire! « Weekly Recap: Recovering from NYC. I know people just love lululemon but i’ve never bought anything from there because I feel like I can find just as nice apparel for less $. $78 for a yoga mat??? That is crazy!!!! Did you get a free one? Sounds like it was a nice event and convenient that they now carry the brands you like! Mill City Running is a great local running store if you ever find yourself in Minneapolis! Great apparel. I agree with you that some of the items I loved have changed or been discontinued (like my favorite sports bra, the bitty bracer!) but I do still like their speed shorts, though the sizing has changed or continues to change. And those swifty tops are great base layers! First Scuba outing finally happened yesterday!! I used to love lulu’s speed shorts, but then they changed the style and the sizing got weird. Now I’m obsessed with Oiselle’s Mac Rogas. I do love the lulu long distance tank so much, but got them when they were on sale. I tend to find great deals on other running brands, so I avoid paying the big bucks on lulu. 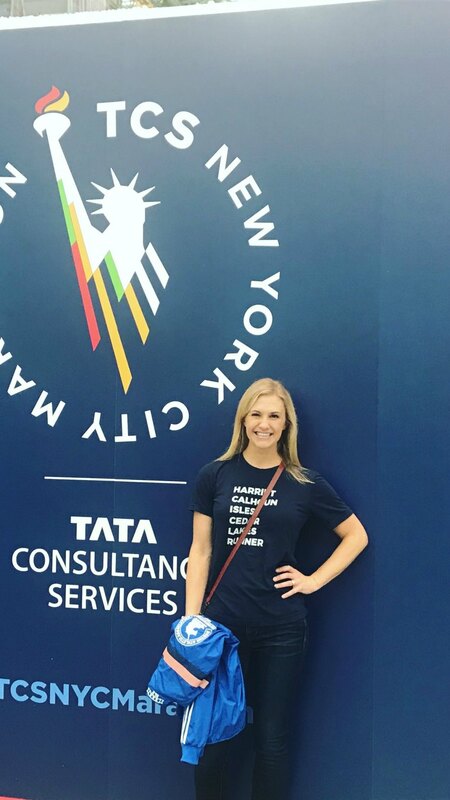 I too love the rogas- I have more pairs than I should care to admit 🙂 But they don’t have as many pockets/pocket space as others, which is one detriment for marathon day, though I often still wear them for marathons. 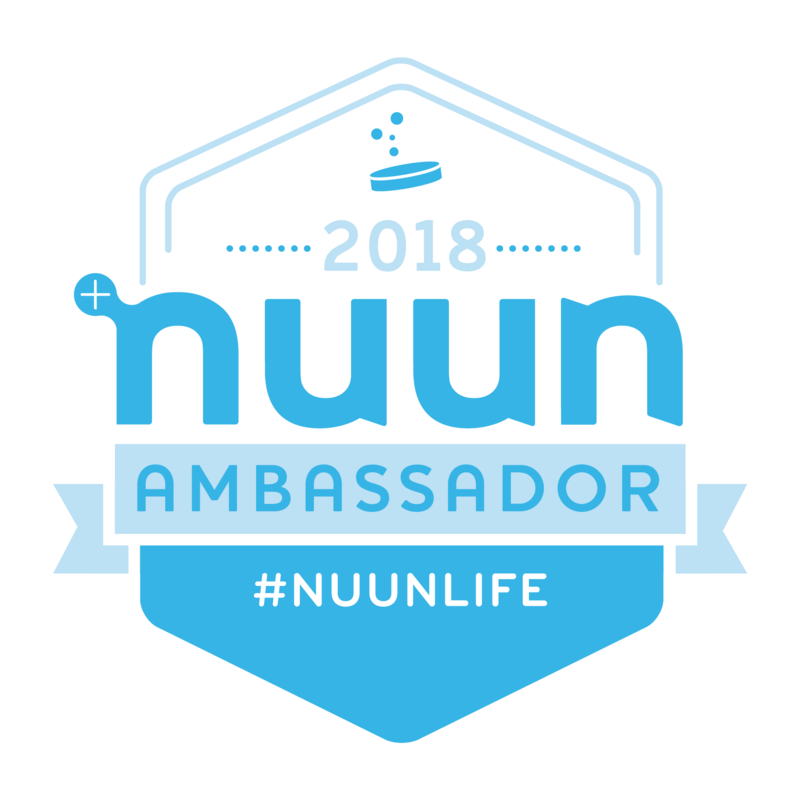 If you are a running coach, you can sign up for the lululemon ambassador program and get 25% off. That’s what I do! I love my lulu speed shorts too. Thats the only shorts i like to wear for running. I am not too particular about tops or bras but shorts, they have to be lulu. The speed shorts are the best 🙂 Thanks for reading Eri!